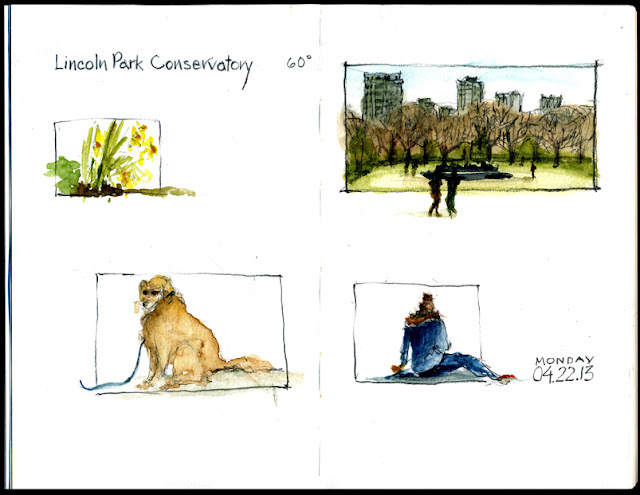 Chicago: The Monday sketch group went to the Lincoln Park Conservatory yesterday. When we planned it we figured if it was gray and cold we could go inside and paint the spring flower show. Yay! The sun was out and it was 60°! I probably spent more time looking at the sky and smiling than sketching! This is done in a Stillman & Birn sketchbook. The Beta series is a favorite of mine. It handles the watercolor well and I love the way the pencil feels on it. 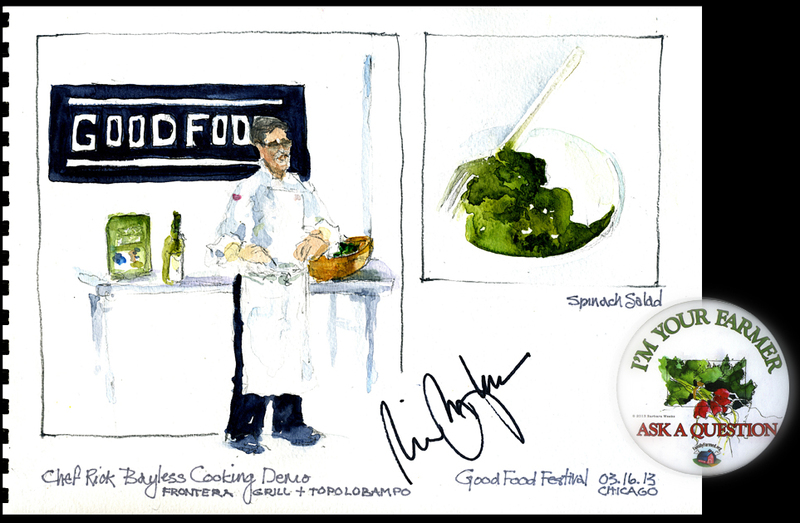 Chicago: For many years I was the art director for Food Product Design and Culinology, two business-to-business magazines that are concerned with bringing good tasting and healthful food to our tables. As a city folk, my husband and I frequent the Green City Market and belong to a CSA. He shops. I sketch. So… needless to say, I was delighted when one of my sketches from these outings was chosen for farmer ID button for the Good Food Festival in Chicago. Bob and I attended the Festival in March–he shopped, I sketched. I'm looking forward to further involvement as Urban Sketcher meets Urban Farmer! I was determined to attend the White Sox opening day game this year, and I did! My husband, my sister and I braved the 37 degree temperature, warmly bundled, and we were rewarded with a Sox win - over Kansas City!! Even better! Looking forward to many more games this year. On the Red Line, I sketched a little with ballpoint pen in a sketchbook I made with grey pastel paper. I increased the contrast at home with a Micron pen. At the ballpark, I sketched in my S&B Beta book with pencil, since my ballpoint decided it was a little too cold to release its ink. Added the color and darker lines at home with Micron pen, water soluble Staedtler pens, and watercolor.